Sandya has spent nearly the last 20 years in a diverse career spanning Business Development, Client Management and Digital Product Management. In her current role as Head of Digital Service at Samsung, Sandya leads a large team who is focused on building exceptional customer service experiences in the digital space including website, social media, email, chat and mobile channels. Her team focuses on servicing customers across all Samsung’s product lines in the US. Prior to Samsung, Sandya worked at American Express where she spent 8 years working in a variety of roles including managing Global communications through the Digital Servicing Organization, as well as managing AXP’s largest strategic clients on the loyalty and bank side of the business. Sandya currently works in Manhattan out of the Samsung office in Meatpacking. She lives in Brooklyn with her twin daughters, Lila and Veda. In her limited free time, she enjoys barre based workouts and decorating her old Victorian house through solo trips to Home Goods. 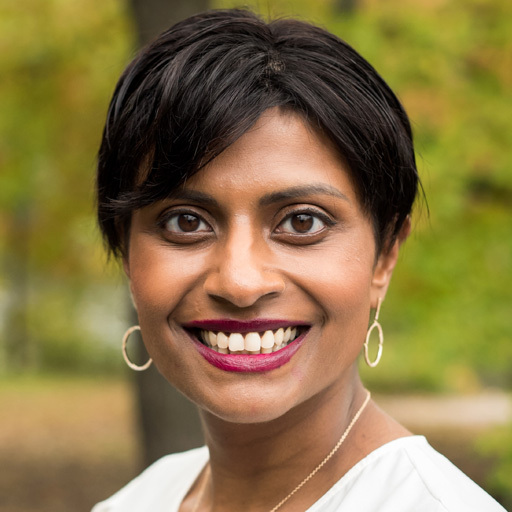 Sandya holds a Bachelor of Arts from the University of Pennsylvania, an M.B.A from Columbia Business School and a Master of Health Sciences Degree from the Johns Hopkins School of Public Health.